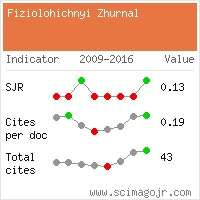 It has been shown, less concentrations of p-chlormercu ribenzoate (1 and 2,5 mM) increased Ca2+ content in gland tissue and thereby protein secretion level that may occured mainly by suppression Ca2+-pump or/and stimulation of Na+-Ca2+-exchange (both in cell plasma membrane) through modulation of SH-groups which form part of their moleculs. Higher PCMB concentrations markedly decreased Ca2+ content in gland tissue as well as protein secretion. Effects of PCMB (5 and 10 mM), depending I.A. Oaa..ei oa .i. .iaioa aeeiiaia ca ni.eyiiy Cao.aii-Oe.a.inueiai oaio.o a.iiaae.ieo aine.a.aiu 40 ISSN 0201-8489 O.c.ie. .o.i., 2001, O. 47, . 3 on the direction of Na+-Ca2+-exchange functioning (Ca2+-efflux or Ca2+-influx), were evoked or pressumably by suppression of endoplasma reticulum Na2+-pump (at conditions Na+-dependent Ca2+-efflux) or Na+-dependent Ca2+-influx into the cells that clearly confirmed when PCMB was added on the backgraund of eosin Y (specific Ca2+-ATPase inhibitor). Possible role of potentialdependent Ca2+-channnels in the mediating of PCMB effects is discussed. Introducing of dythiothreitol (DTT) increased Ca2+ content in glands and decreased secretion level obviously by protection of SHgroups of cell Ca2+-transporting systems and thereby diminished [Ca2+]i. Finnaly, we confirm important functional role of SH-groups in the regulation of Ca2+-homeostasis in secretory cells of exocrine glands. Болдырев А.А. Биологические мембраны и транспорт ионов. – М.: Изд-во Моск. ун-та, 1985. – 206 с.
Диксон М., Уэбб И. Ферменты / Под ред. А.И.Опарина.- Изд-во иностр. лит.,1961. –726 с.
Клевець М.Ю., Манько В.В. Характеристика потенціалозалежного кальцієвого стру- му мембрани секреторних клітин // Физиол. журн. – 1992. – 38, 3. – С. 70 – 75. Клевець М.Ю., Манько В.В., Федірко Н.В. Дослідження нагромадження кальцію секреторними клітинами ізольованих слинних залоз личинки хірономуса та його значення для секреторного процесу – Львів: Львів. ун-т. 1996. – 22 с.: іл. 2.– Бібліогр. : 42 назв. – Укр. – Деп. в Укр. ІНТЕІ 29.10.96, N 87 – Ук 96. Клевец М. Ю., Манько В. В., Федирко Н. В. Зависимость тока натрий-кальциевого обмена через мембрану клеток слюнной железы личинки хирономуса от рН внекле- точного раствора // Нейрофизиология / Neurophysiology. – 1996. – 28, 4/5. – С. 193–196. Манько В.В. Вплив катіонів перехідних металів на Na+–Ca2+-обмін плазматичної мембрани клітини // Укр. биохим. журн. – 1998. – 70, 6. – С. 3–12. Манько В.В., Клевець М.Ю., Федірко Н.В. Вплив катіонів нікелю і кадмію на амплі- туду вхідного струму Na–Ca-обміну мембрани секреторних клітин екзокринних за- лоз // Експерим. та клін. фізіологія і біохімія. – 1997. – 2. – С. 214 – 215. Слинченко Н.Н., Браткова Н.Ф., Костерин С.А., Черныш И.Г. Влияние эозина Y на каталитичемкую и функциональную активность Mg2+, ATP-зависимого кальциевого насоса плазматической мембраны гладкомышечных клеток // Биохимия. - 1998. – 63, 6. - С. 812 - 819. 9. Торчинский Ю. Сера в белках. – М.: Наука, 1977. – 355 с. 10. Федірко Н.В., Клевець М.Ю. Докази стаціонарного входу Са2+ у секреторні кліти- ни слинної залози личинки Сhironomus plumosus L. та його роль у базальній сек- реції // Фізіол. журн. – 1999. - 45, 4. – С. 84-92. Федірко Н.В., Клевець М.Ю. Вплив еозину Y та ортованадату на стаціонарний вхід Са2+ у секреторні клітини екзокринних залоз та базальну секрецію // Фізіол. журн. – 2000. - 46, 6. - С. 3-9. Beauge L., DiPolo R. Chemical modification of intracellular sulfhydryl groups drastically modifies the affinity of the Cai regulatory site of the Na/Ca exchanger // Biophysical J. - 1992. - 61. - P. A388. - 2236. Busselberg D. Calcium channels as target sites of Heavy metals // Toxicol. Lett. - 1995. - 12, 82/83. - P. 255-261. Egger M., Ruknudin A., Niggli E. et al. Ni2+ uptake mediated by the human cardiac Na-Ca exchange // Abstract of 41st Annual Meeting of the Biophysical Society, New Louisiana, USA. - Biophys. J. - 1997. - 72, N 2, part 2. - P. A164. - Tu-Pos145. ISSN 0201-8489 Фізіол. журн., 2001, Т. 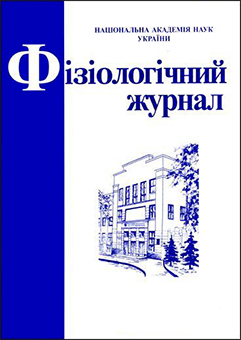 47, № 3 41 III International Congress of Pathophysiology, Lahti, Finland, 28 June – 3 July 1998: Abstract book. – Pathophysiology. – 1998. –5, Suppl. 1, June. – P. 134. Frame M.D.S., Milanick M.A. Mn and Cd transport by the Na-Ca exchanger of ferret red blood cells // Amer. J. Physiol. - 1991. - 261. - P. C467 - C475. Lee, C., Okabe ,E. Hydroxyl radical-mediated reduction of Ca-ATPase activity of masseter muscle sarcoplasmic reticulum. - Jpn.. Pharmacol.. - 67, 1. – P. 21 - 28. 19. Lowry O.H., Rosenbrough N.H., Farr A.L., Kondall R.J. Protein measurements with Folin protein reagent // J. Biol. Chem. - 1952. - 193, N 2. - P. 265 - 275. 20. Monte D., Belomo G., Thor H., Nicotera P., Orrenius S. Menadione-induced cytotoxicity is associated with protein thiol oxidation and alteration in intracellular Ca2+ homeostasis // Arch. Biochem. and Biophys. - 1984. - 235, 2. - P. 343-350. Nicoll D.A. ,Longoni S., Philipson K.D. Molecular cloning and and fuctional expression of the cardiac sarcolemmal Na-Ca-exchanger // Science. – 1990. – 250. – P. 78 – 81. Senchuk, V.V., Pikulev, A.T., Dashkevich, I.N. Study of the modification of histidine residues, SH- and epsilon-NH2-groups of rat sarcoma-45 myosin by specific reagents // Biokhimia. – 55, 9. – P. 1648 – 1654. Shepard K., Simkiss K. The effects of heavy metal ions on Ca2+-ATPase extracted from fish gills // Comp. Biochem. Physiol. - 1978. - 61B. - P. 69-72. - P. 11988 - 11994. Takahashi, H., Yamaguchi, M., Role of regucalcin as an activator of Ca2+-ATPase activity in rat livar microsomes // J.Cell Biochem., - 74, 4. – P. 663 – 669. Tepikin, A.V., O.H.Petersen. Mechanisms of cellular calcium oscillations in secretory cells // Biochim. et Biophys. acta. - 1992. - 1137. - P. 197-207. Valenzuela, Bender (1971) - цит. За Ленинджер А. Биохимия: Пер. с англ. – М.: Мир, 1974. – 955 с.